This morning, Acer is looking to dive head first into the 7″ tablet game with their new Iconia A110 tablet. Fans of low-priced, but hot spec-packing slates should definitely feel something for this device once it hits U.S. shores on the eve of Halloween. Powered by NVIDIA’s Tegra 3 processor and a 1GB of RAM, this tiny powerhouse will look to fit in right alongside a Nexus 7, yet the only difference so far is that the only available size is 8GB. Although keep in mind, it does come with MicroSD support. 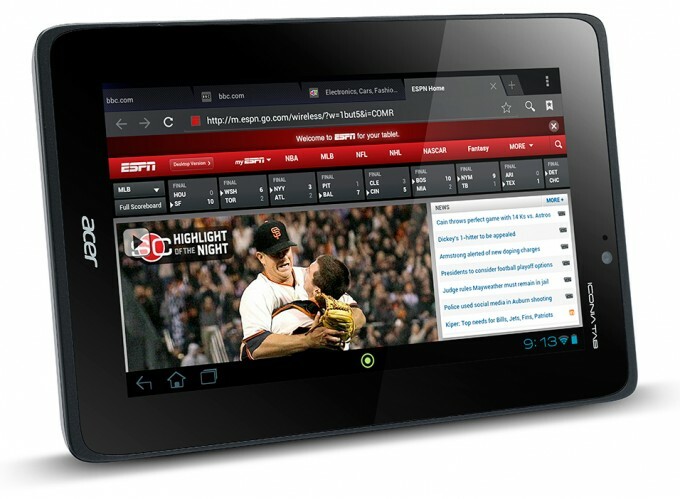 Coming with the newest Android 4.1 Jelly Bean firmware, the device sports a 1024×600 7” LCD display, weighs in at 0.86 lbs, and features HDMI-out. The tablet will hit retailers on Oct. 30 for the handsome price of $229. What do you think? Can this tab compete with Google’s offering? With MicroSD support, it most certainly could. SAN JOSE, Calif., (Oct. 18, 2012) Acer America today expanded its Iconia™ Tab lineup with the A110, a lightweight, pocket-sized 7-inch multi-touch tablet. Available Oct. 30 in the United States and Canada, the compact and stylish Iconia Tab A110 is perfect to tote around at all times to read, browse, play games and enjoy media. Powered by the latest Android™ 4.1 “Jelly Bean” operating system, the A110 tablet provides faster and smoother performance for applications and widgets. Users can customize and expand their tablet experience with ease using the Android™ Market to choose from hundreds of thousands of apps to enjoy the A110 any way they want. Also preloaded on the A110, Google Play provides users with an entertainment hub and allows one place to find, enjoy and share apps, music, movies and books from across the web. Google Currents provides free online magazines from hundreds of publishers and online. supports long battery life with smart power management providing up to 7.5 hours of battery life. Offering superior expansion and connectivity, the Iconia Tab A110 has a micro-USB 2.0 port for hooking up other devices, and a MicroSD slot providing additional storage up to 32GB and easy file transfers. For showcasing entertainment in a larger format, users can easily connect to an external LCD or HDTV via the A110’s MicroHDMI output, with dual display support. For added enjoyment, a two megapixel front-facing web camera enables face-to-face chats or quick snaps for still photos. Bluetooth® 3.0 technology allows users to wirelessly connect to other devices such as Bluetooth printers, keyboards, headsets or speakers. The A110 also includes 1GB of memory and 8GB internal storage. AT&T Claims Softbank Will Have "Control of More U.S. Wireless Spectrum than any Other Company"